It is important to keep in mind that On-Campus Interviews (OCI) is just one resource to use in your career search. Before participating in OCI’s make sure you are interested in the jobs and companies posted in LionSHARE. Employers who participate in OCI are primarily large firms with a very structured internship or entry-level full-time programs. You will see many finance, consulting, and big technology firms along with some advertising, fashion, not-for-profit, and government employers. If you do not see companies of interest conducting interviews on campus, it does not mean they aren’t hiring. Most companies hire “as-needed” and post opportunities in various ways from postings in LionSHARE to tweeting their positions and interviews at their offices. PLEASE REVIEW GUIDELINES BELOW PRIOR TO PARTICIPATING IN ON-CAMPUS INTERVIEWS. In order to maximize opportunities for you, to preserve the integrity of LionSHARE, and employers who come to campus, CCE has developed a set of guidelines. Failure to adhere to these expectations may result in a LionSHARE warning, suspension or loss of recruiting privileges. Please watch this video on On-Campus Interviews and take a short quiz to learn more about these guidelines and how to best prepare. You are able to cancel an on-campus interview at least 2 business days prior to the interview without penalty, you can reschedule an interview timeslot by removing yourself from the interview slot in LionSHARE or contacting CCE at least 2 business days prior to the interview; however, potential to reschedule are subject to availability. You should never cancel a first-round OCI for a second-round interview with another employer. Employers participating in OCI are required to give you 72 hours notice of a second round interview and provide an alternate date if the first date represents a reasonable scheduling conflict (including a commitment to a first round interview with another employer on-campus). If you are unable to attend your interview on the day it is scheduled for any reason, you are required to contact CCE. A first-time violation of the above: You will receive a warning for the remainder of the semester. Second-time violation of the above: You will be immediately suspended from On-Campus Interviews for the remainder of the semester. Employers recruiting Columbia University students are asked to follow the following offer guidelines. Employers are encouraged to accommodate reasonable student requests to extend offer deadlines. Students will have two weeks from the date a written oﬀer letter is received or until the deadlines below, whichever is later. All offers extended to previous summer interns or as a result of 2019 summer or fall recruiting efforts should be held open until October 25, 2019. All offers extended as a result of 2020 spring recruiting efforts for employment start dates within the 2020 calendar year should be held open until February 21, 2020. All offers extended as a result of 2020 spring recruiting efforts for employment start dates within the 2021 calendar year should be held open until October 23, 2021. An exploding offer is when an employer extends an offer and gives you 24-28 hours to respond, or else the offer is taken away. Exploding offers are prohibited. Sign-on bonuses should be honored whenever offers are accepted. If you go abroad during the fall or spring semester, you are eligible to participate in OCI. You should indicate your study abroad location to employers via your cover letter and resume. If accepted for an OCI, sign up for an interview slot that works with your schedule and notify CCE immediately in order to effectively coordinate your interview with the employer (either via video or phone). Most employers participating in OCI expect you to interview in person. Some are willing to accommodate a remote interview (via phone, Skype, Zoom, etc. ), CCE will work with you and the employer to schedule the interview at a mutually agreed date and time. As a study abroad student, you are required to follow all OCI guidelines. Columbia University is committed to providing a working and learning environment free from unlawful discrimination and harassment. Consistent with this commitment and with applicable federal, state and local laws, it is the policy of the University as both an educational institution and an employer to prohibit unlawful discrimination and harassment and to provide faculty, students, and staff who believe that they may be the victims of either with mechanisms for seeking redress. We recommend that all students, alumni, vendors, and employers engaged in activities with the Center for Career Education review Columbia’s Policies and Procedures on Discrimination and Harassment. If a student or staff member engaged in an activity sponsored by the Center for Career Education (including but not limited to job listings, workshops, panels, counseling sessions, employer presentations, career fairs, interviews, mentoring, internships, off-campus recruiting, and employment) believes that the Discrimination and Sexual Harassment Policy and Procedure may have been violated, he or she is urged to contact the Office of Equal Opportunity and Affirmative Action, a member of the Columbia University Panel on Discrimination and Sexual Harassment, or the Executive Director of Employer and Alumni Relations for the Center for Career Education. If the conduct complained of involves a person or persons within the Columbia community, the actions provided for under the Discrimination and Sexual Harassment Policy and Procedure may apply. 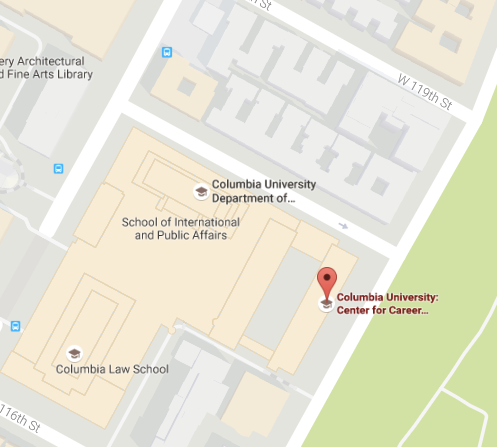 If the conduct complained of involves, in addition to a member of the Columbia community, a party or parties outside the Columbia community, the Center for Career Education may conduct an inquiry. In the event the Center for Career Education determines that the complained-of conduct occurred or the outside party chooses not to participate in the inquiry, the Center for Career Education may act to sever the relationship between the Center Career Education and/or Columbia University and the outside party or organization.